Are you doing more harm than good when you marinate meat? Here are some ways to ensure you're marinating the right way — and for the right reasons. 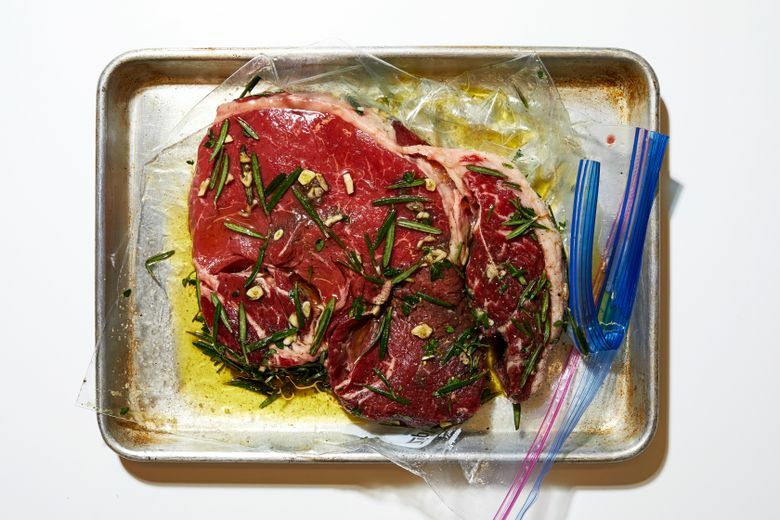 For a lot of home cooks, marinating meat is almost as automatic as cooking the meat itself. Douse the meat in some kind of flavored liquid, pop it in the refrigerator overnight and cook it the next day. Seems straightforward enough, but there are reasons to put a little more thought into how you marinate. More and more, we’re hearing as much about what marinades can’t do as what they can. And in some cases, you may be doing more harm than good. Here are some ways to ensure you’re marinating the right way — and for the right reasons. — Think about what goes into your marinade. Marinade ingredients generally fall into three categories, according to Raichlen: acids, oils and aromatics. Acids — think of them in terms of sour flavors — can include citrus juice, vinegar and yogurt. Oils, which help keep the meat from drying out, can be neutral in flavor (canola, vegetable, peanut); in-between (olive, nut); and assertive (sesame). The world of aromatics is wide, including garlic, onions, ginger, herbs, chile peppers and spices. Make sure your marinade contains a salty component, because that is one of the most effective flavoring agents. But “it doesn’t have to actually be salt,” Raichlen says, so feel free to use soy sauce, miso or fish sauce. A marinade’s flavor will evolve as it cooks, but it should taste good even before you use it, Raichlen says. Especially if you’re winging it, be sure to sample along the way (before it goes on the food, in other words). — Don’t expect it to penetrate that much. Turns out, marinades are essentially a surface treatment. Most flavors will not go farther than a few millimeters into meat. Raichlen, however, is fine with that, because, as he points out, the surface is what you taste first. The limited distance traveled is another reason marinades are generally better for lean proteins — chicken breasts, flank steak, shrimp: You’ll get a better ratio of flavored surface per serving than you would in a larger, thicker cut of meat. — Longer does not mean better. Marinating for hours on end does not change the very shallow depth that a marinade penetrates. You can often get the same results in an hour or less as you would overnight. Still, it’s hard to argue with the convenience of preparing meat in advance and using it later. But how long should you marinate? In “Barbecue Sauces, Rubs, Marinades — Bastes, Butters, and Glazes, Too,” Raichlen gives a rough guide to marinating times. The times will also vary somewhat on the strength of your marinade, according to Raichlen (an herb marinade won’t impart its flavors as quickly as one with strong spices or chile peppers.) Also keep in mind that extended marinating does not further tenderize meat. The “tenderizing” effect the acids in marinades have is, in fact, the breakdown of proteins on the surface of meat or seafood. (Ceviche, raw seafood treated with a very acidic marinade, is a good example of how powerful ingredients such as lemon or lime juice can be in changing texture.) Use too much acid or leave something in it too long, and what you get is mushiness. — Do it safely and smartly. Always marinate proteins in the refrigerator, Raichlen says. Keep the food covered, and make sure you are marinating in glass, ceramic, plastic or stainless steel. Reactive materials such as aluminum and cast-iron can cause off-flavors in the food when they come in contact with acid. Zip-top plastic bags make for tidy marinating, though you may want to place them inside another container to catch any potential leaks. Bags also allow you to easily flip and massage the food to ensure even coverage. Do not serve marinades that have come in contact with raw proteins. When you want to use marinades as a sauce, Raichlen suggests boiling the “used” liquids for at least three minutes to kill any potential pathogens. But to be extra-safe, he also suggests setting aside some of the marinade for sauce purposes before you use the rest. Blotting off most of the excess marinade on the surface of the food prevents grill flare-ups, keeps marinade ingredients from charring (herbs and garlic can burn quickly) and allows for effective searing on the stove top.